Interstate 355 (Veterans Memorial Tollway) converges with I-88 (Ronald Reagan East West Tollway) at a three wye interchange in the village of Downers Grove. The two routes run directly along side each another a short distance southwest to the village of Lisle. Photo taken 09/03/05. Interstate 355 in Illinois is the Veterans Memorial (North-South) Tollway. Part of the Illinois Tollway System, I-355 connects Interstate 80 in New Lenox with Interstate 290 in Addison. The toll road meets Interstate 55 in Bolingbrook and crosses Interstate 88 (Ronald Reagan Memorial Tollway) at Downers Grove. Legislature authorized the North South Tollway in 1984 and construction commenced on the $450-million project in October 1986.6 Interstate 355 was commissioned between I-55 and I-290 with the completion of the toll road on December 24, 1989.3 I-355 extended south from a previously constructed section of the Illinois 53 expressway between I-290 and Army Trail Road to I-55. I-355 was toll free until December 26, 1989, when rates of $1.00 per passenger vehicle went into effect. The final section of I-355, from I-55 south to Interstate 80, opened on November 12, 2007 at a cost of $730 million.5 AASHTO approved Interstate 355 for the completed extension on May 6, 2008. The 1988 official Illinois Tollway map showed the proposed North-South Tollway as Interstate 455. The following year, the route was changed to I-355. This information was conveyed to mapmakers in 1988, and as a result, Interstate 455 appeared in a few commercial maps of the same vintage. Interstate 455 was never signed – the North South Tollway was always Interstate 355 once it opened in 1989. The 12.5 mile extension of Interstate 355 (North-South Tollway) was cleared for construction in 2002, following a series of delays due to environmental and other concerns. Even so, the I-355 extension remained listed by the Sierra Club in 2002 as a route that should not be constructed, so opposition to this road remained high. A further extension of Interstate 355 south to Interstate 57 was proposed. Such an extension could potentially connect to the long-proposed Illiana Expressway, which would travel east through Will County to Interstate 65 in Indiana. Neither the extension to I-57 nor the link to the Illiana Expressway is currently projected for construction in the near-term, but both routes have been proposed if not studied to some extent. If an airport is constructed in Peotone as was once proposed, then an extension of I-355 would be even more likely. Another consideration would be related to whether the Illiana Expressway is built to relieve the burdened Borman Expressway and Kingery Expressway corridor (Interstate 80-94-294). 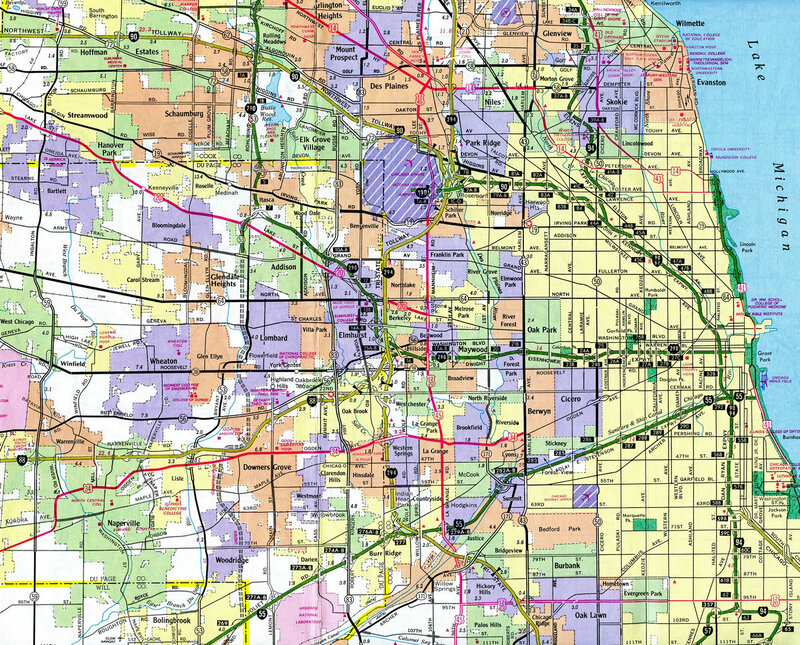 [According to the Will County] 2020 Transportation Plan, the county seems to feel that its residents are ardent supporters of the [recent extension of Interstate 355 south to Interstate 80]. Will County was one of the fastest growing in the state between 1990 and 2000, and the Census Bureau estimated almost 6% growth (to over half a million people) in just the first fifteen months following Census 2000. Also, as for a further extension, Will County at least seems to favor a western and southern bypass of New Lenox. That would mean travelers on future southbound Interstate 355 would have to merge onto westbound Interstate 80 for about a mile before continuing south [toward Interstate 57]. 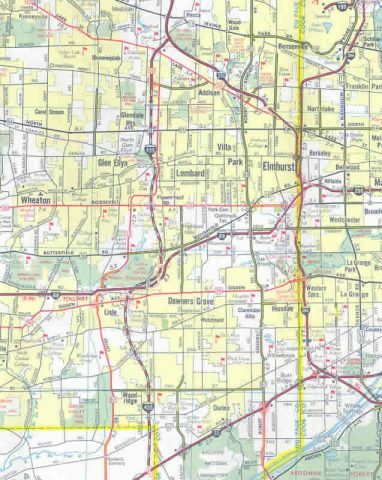 You can see their corridor, which extends across Interstate 57 to the Indiana border, at the above Transportation Plan link (no longer online). From firsthand experience trying to navigate the county even two years ago at rush hour, all of the above extensions would be put to good use. These future plans depend heavily on the South Suburban Airport planned for Peotone. With Mayor Richard Daley in Chicago pushing for O’Hare Airport expansion, things are really up in the air, pun intended. While the O’Hare project isn’t a done deal, some land acquisition has started, but the same is true of the Peotone Airport. Governor Ryan was a big supporter of the Peotone project (he hailed from Kankakee County, immediately to the south of Peotone), but I think Governor-elect Blagojevich will be more inclined to go along with Mayor Daley. In short, don’t look for any earth-movers in the next five years [not until well after 2007], either on Interstate 355 south of Interstate 80 nor on a South Suburban Airport. But plans are in the works, and if the growth continues, something will have to be done eventually. Plus, airport construction would make the highway a virtual certainty, at least in some form. Widening, resurfacing and/or reconstruction of 90+% of the tollway system. Converting the current toll system to “open road tolling” where I-PASS users would be able to pass through all toll plazas at posted highway speed, while cash paying customers are routed off the road. Tolls were doubled to $0.80 for cash paying customers and were raised to $3-$4 for trucks. I-PASS users a guaranteed a rate freeze for 10 years. Construction of the “next” leg of Interstate 355 from its terminus at Interstate 55 in Bolingbrook, to Interstate 80 near New Lenox. Ultimately plans call for Interstate 355 to extend to Interstate 57 near Peotone, where it would connect to another road to be built by the Indiana Department of Transportation (the “Illiana Expressway”). 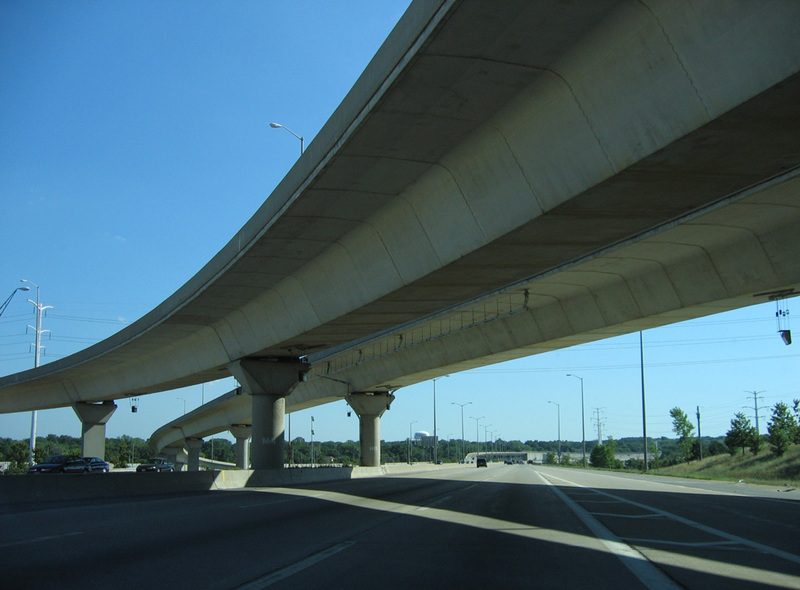 Construction of Interstate 355 is expected to began around Thanksgiving 2004, and was completed in November 2007. Beyond Illinois 53 (Rohlwing Road), Interstate 355 north expands to four lanes than five before partitioning into ramps for Interstate 290. All signs for the terminus were replaced by 2012 with Clearview font based panels. Photo taken 05/24/08. Entering the three-wye interchange with Interstate 290 (Eisenhower Expressway) on I-355 north. Rockford lies 55 miles to the northwest via I-290 west to Interstate 90 west. I-290 otherwise turns southeast from Interstate 355 through the suburbs of Addison and Elmhurst before meeting the East-West Tollway (I-88) and Tri-State Tollway (I-294). Photo taken 05/24/08. The first appearance of Interstate 355 (North-South Tollway) on westbound I-290 was at the Biesterfield Road (IL 53) overpass. These signs were replaced after 2012. Photo taken 09/03/05. Interstate 355 splits from I-290 (Eisenhower Expressway) east beyond the exchange with the Elgin-O’Hare Expressway and Thorndale Avenue. Construction underway here by 2015 upgraded this interchange as part of the Illinois 390 project. Photo taken 09/03/05. 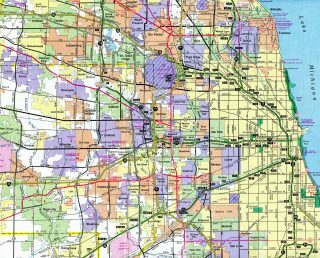 Interstate 355 travels through or near the western suburbs of Addison, Glendale Heights, Lombard, Glen Ellyn, Downers Grove, Lisle, Woodridge and Bolingbrook. Photo taken 09/03/05. Passing east of an industrial park area, the five lanes of I-290 east prepare to split with a left-hand ramp (Exit 7) for Interstate 355 south. Photo taken 09/03/05. Illinois 19 (Irving Park Road) spans Interstate 290 (Eisenhower Expressway) east just ahead of the three wye interchange (Exit 7) with the Veterans Memorial Tollway. Photo taken 09/03/05. Exit 7 leaves Interstate 290 as the Eisenhower Expressway turns southeast toward Chicago. 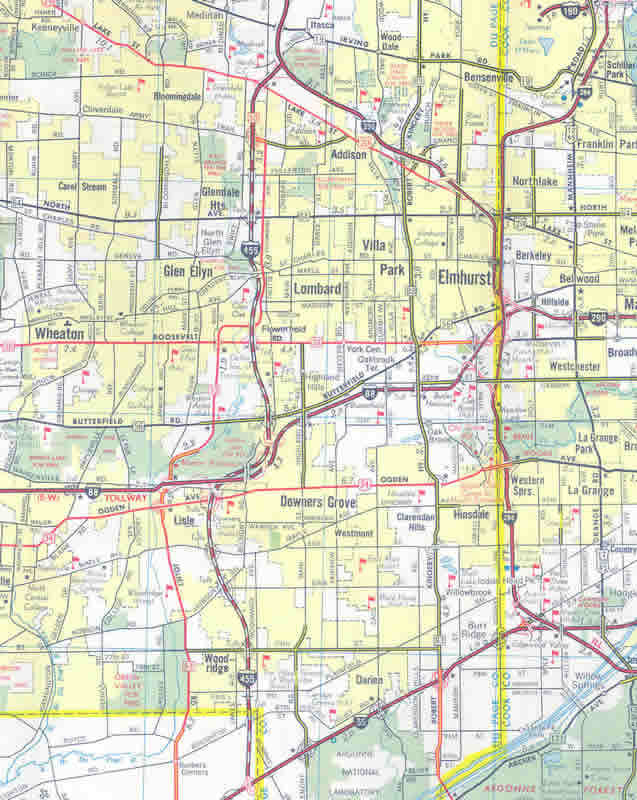 The 2007-opened extension of I-355 serves Lemont, Lockport and New Lenox as well as eastern Joliet. Photo taken 09/03/05. Posted within the cloverleaf interchange with Illinois 83, the first sign for I-355 south appears along I-290 west. Signage for Interstate 355 also notes the first Tollway exit to U.S. Route 20 (Lake Street) in Itasca. This set of signs was replaced with Clearview-font based panels by 2011. Photo taken 05/09/10. Advancing northwest by Maple Meadows Golf Club and an older suburban street grid, Intestate 290 (Eisenhower Expressway) passes below the next set of signs for Exit 7 and I-355 prior to the Mill Road overpass. Photo taken 09/03/05. The final approach to Exit 7 takes I-290 west along side Songbird Slough Forest Preserve to the two-lane flyover for Interstate 355 (North South Tollway). Photo taken 09/03/05. Interstate 290 turns north and merges with a three-lane on-ramp from the ending I-355 as Exit 7 parts ways for adjacent U.S. 20 (Lake Street) and I-55 near Joliet. Photo taken 09/03/05. The initial signs for Interstate 80 and the southern terminus, one month prior to the opening of the Veterans Memorial (North-South) Tollway. Photo taken by Bill Burmaster (10/13/07). Southbound I-355 (Veterans Memorial Tollway) meets U.S. 6 (Southwest Highway) at a folded diamond interchange. Eastward, U.S. 6 passes through Marley en route to Cook County. U.S. 6 west travels to Downtown Joliet. Photo taken by Bill Burmaster (10/13/07). The left lane will connect to Interstate 80 east to Tinley Park, Landing and Gary, Indiana. The right lane connects to Interstate 80 west to Joliet and the Quad Cities. Photo taken by Bill Burmaster (10/13/07). Southbound Interstate 355 comes to an end as the tollway splits. There were provisions in the design of this interchange to allow for the freeway to be extended further southeast from here. The project manager indicated to Bill Burmaster that the interchange at Interstate 80 was designed to allow for Interstate 355 to head south past Interstate 80, but was changed by July 2007. The original design had the main line lanes heading through the middle of the interchange. That is why the median widens as it approaches I-80. Photo taken by Bill Burmaster (10/13/07). An end sign was posted at the sign bridge for Interstate 80 after the tollway opened. Milepost zero appears at the I-80 underpass on the eastbound on-ramp. Photos taken by Jeff Royston (11/19/07). The I-355 mainline defaults onto Interstate 80 east toward the Indiana East-West Tollway and South Bend. A single lane ramp serves interests across south Joliet to Peru and Moline. Photo taken 05/09/10. Interstate 80 curves northeast from U.S. 30 and Hickory Creek to pass under the Commonwealth Edison (Exelon) power line corridor just ahead of Interstate 355. These massive towers support 345kV and 138kV lines as they run along the west side of the tollway through the outer suburbs of Chicago. Photo taken 06/20/15. Francis Road spans Interstate 80, one mile ahead of the directional T interchange (Exit 140) with Interstate 355 (Veterans Memorial Tollway) north. Photo taken 06/20/15. Interstate 355 uses Rockford as the control city for the connection with Interstate 90 (Jane Addams Memorial Tollway) west from Interstate 290. Photo taken 06/20/15. Exit 140 departs I-80 east at the Cedar Road overpass for Interstate 355 north. The tollway angles northwest by the Cedar Crossings development and by remaining agricultural areas to the first mainline toll plaza. Photo taken 06/20/15. A begin sign for I-355 stands between the roadways just east of the Cedar Road overpass. Major power lines cross over the I-80 / 355 exchange. These were realigned as a result of the interchange construction. Photo taken by Bill Burmaster (11/13/07). The first sign for the previous southern terminus of Interstate 355 appears at the 75th Street interchange. The penultimate exit is Boughton Road. Photo taken 09/03/05. Former signs posted at the diamond interchange with Boughton Road on I-355 south. These were posted above the cash lanes departing from the adjacent main line toll plaza. Use Interstate 55 northeast to downtown Chicago and southwest to Joliet and Springfield as well as St. Louis. Photo taken 09/03/05. The North-South Tollway concluded as a four-lane roadway prior to 2005. These button copy signs were eventually replaced with a diagrammatic overhead to show the third southbound lane. Photo taken by Jeff Royston (1/02). A trumpet interchange previously connected the south end of I-355 with Interstate 55. Photo taken 09/03/05. I-355 ended as traffic partitioned for Interstate 55 northeast to Downtown Chicago and southwest to Joliet, Springfield and St. Louis. Photo taken 09/03/05. Button copy end sign for Interstate 355 posted on the transition ramp to I-55 north. Bridge supports were prebuilt for the eventual southern extension to New Lenox. Photo taken by Jeff Royston (1/02). This set of button copy signs was posted at the diamond interchange (Exit 267) for Illinois 53. The I-355 panel was eventually removed by 2008 while the IL 53 panel was replaced. IL 53 parallels all of Interstate 355 to eventually tie into Interstate 290 near the northern terminus. Photo taken by Brian Dowd (06/02). This one mile overhead for Interstate 355 was replaced by 2008 to reference just Tollway as the southern extension opened. West Suburbs was replaced with simply Suburbs. Photo taken by Brian Dowd (08/16/02). A collector distributor roadway (Exit 269) departed I-55 north for Interstate 355 ahead of the wye interchange with Joliet Road (Historic U.S. 66). The North-South Tollway serves the Western Suburbs of Addison, Downers Grove, Glen Ellyn, Glendale Heights, Lombard and Woodridge. Photo taken by Eric W. Vander Yacht (04/01). Traveling on the former c/d roadway from Joliet Road (Historic U.S. 66) north to I-355. A distributor roadway replaced this set of lanes when the Veterans Memorial Tollway was extended south. Photo taken by Brian Dowd (06/02). A loop ramp departed for Interstate 355 (North South Tollway) as I-55 continued another 14 miles to the Chicago city limits. Photo taken by Brian Dowd (08/16/02). “Work under way on 355 South Extension in Illinois.” Tollroads News, April 1, 2005. Dan Hobson, personal email (“New toll rates on IL Tollways”), Saturday, May 14, 2005. Encyclopedia of Chicago: Expressways by Dennis McClendon of the Chicago Historical Society. Encyclopedia of Chicago: Tollways by David M. Young of the Chicago Historical Society. “New superhighway opening soon in Will.” Chicago Tribune, October 21, 2007. “Opening of I-355 will put some zip in Du Page traffic.” Chicago Sun-Times, December 22, 1989. “Lake County’s Lawlor pulls Route 53 support; study still on?.” Daily Herald, May 16, 2016. Page updated May 18, 2016.